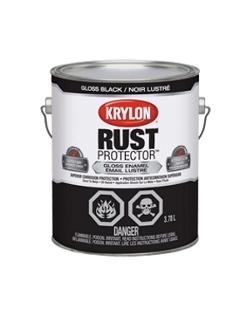 Product Description: A fast-drying alkyd enamel quickly stops corrosion without a primer and offers superior durability and adhesion. Alkyd enamel can be used on all metals, wood, masonry, concrete, wicker, ceramic, glass, and plaster. Direct to metal corrosion protection. Smooth, durable, rust-fighting finish. Coverage (Gal): Up to 500 sq. ft. Application / Dilution: Paint outdoors or in a well-ventilated area. Protect surrounding areas. Best results when air & surface temperature is between 4.4°C (40°F) - 26.7°C (80°F). For best results, do not use in high humidity. Stir thoroughly. Do not thin. Clean-up: Mineral spirits or paint thinner. Surface Preparation: Surface should be clean, dull & dry. Remoove loose rust & paint with wire brush or sand paper. Size & Bases: Gallon - Black, white, red, yellow.